The Royal Navy vessel H.M.S. Fidelity (D57) [seen in photograph No. 1]. She had a short but eventful career. While her story has been told before, few have been able to relate personal memories of those who knew her and served on her. When she was lost, as the turn of the year 1942 / 1943, almost all those who served on her perished. Thus, after the war, only a small number of people had personal memories of the vessel and what it was like to serve on her. To set the scene, let us look at the remarkable journey that led to a French Merchant Navy vessel, ‘Le Rhin’, becoming a Royal Navy vessel, H.M.S. Fidelity. She began life in Britain, being built by H. & C. Grayson Ltd. of Garston, Liverpool and was completed in 1920 for Compagnie de Navigation Paquet, Marseille. For the next 20 years or so, SS ‘Le Rhin’ conveyed goods to and from her home port of Marseille and around the Mediterranean. It was in the summer of 1940, following the German offensive and breakthrough in Belgium and northern France, that destiny changed the route that SS ‘Le Rhin’ would henceforth follow. In addition, she would change from being a rather mundane merchant vessel to a remarkable one of intrigue and espionage. She would also change her name to H.M.S. Fidelity, a vessel of the Royal Navy. In June 1940, laden with plundered goods from Marseille, S.S. ‘Le Rhin’ put in to Gibraltar at the western end of the Mediterranean. The remarkable change in her destiny was in part due to a small group of Belgians who arrived in Gibraltar about the same time and went on to join her crew. The role of the Belgians is dealt with later in this article. The route into Gibraltar from the sea can be seen in photograph No. 2 (above). From Gibraltar, ‘Le Rhin’ sailed to Barry, South Wales and subsequently refitted and took on her new name, H.M.S. Fidelity. The original French civilian skipper (‘Lieutenant de vaisseau’) of ‘Le Rhin’ in 1940 René Victor Cannebotin (born Bordeaux, 25 May 1899). He served in the Royal Navy on ‘Fidelity’ under the ‘nom de guerre’ of Lieutenant-Commander René W. Doudet. However, the self-appointed commander of ‘Le Rhin’ in the summer of 1940 was a French ‘5e Bureau’ agent (‘Enseigne de vaisseau) Claude Andre Michel Péri (born 7 April 1908, Hanoi, French Indo-China). Photograph No. 3 (above) shows Claude Péri (on the left) and ‘Le Rhin’ as a French merchant navy vessel (on the right). Claude Péri’s ‘nom de guerre’ while serving in the Royal Navy was Jack Langlais (i.e. Jack of England!). Most of the original French merchant navy crew left ‘Le Rhin’ after she put into Gibraltar. With the political grave military situation of the time it had become a rebellious crew. The Frenchmen who remained were determined to continue the fight. There was also a Frenchwoman on board: Madeleine Victorine Bayard (born 21 February 1911, Paris). She was a saboteur ‘par excellence’ and romantically attached to Claude Péri. Unusually for a Royal Navy vessel, Madeleine Bayard continued to serve at sea on H.M.S. Fidelity as a WRNS officer (1st Officer) with the ‘nom de guerre’ of Madeleine Barclay. 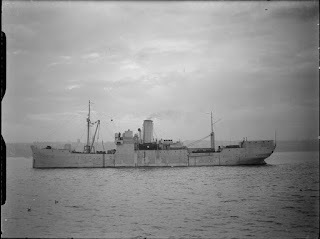 Before S.S. ‘Le Rhin’ embarked for Barry, South Wales there were others who came on board determined to fight the Nazis. A small group of Belgian officers arrived in Gibraltar about the same time, at the end of June 1940, after being evacuated from Sète on the French Mediterranean coastline. The small group of Belgians was about thirteen in number. A number of this select group of Belgian officers went in to have a distinguished war service. For example, one of them was Captain Georges Danloy who joined the Commandos and immediately after the war became Commanding Officer of the Belgian Commandos. Another Belgian who evacuated from Sète to Gibraltar at this time was Baron Jean Michel de Selys-Longchamps. He was awarded the D.F.C. while serving with 609 Squadron of the R.A.F. after a successful, but unauthorised, attack on the Gestapo headquarters in Brussels in January 1943. However, for the purposes of this article, it is a small group of three Belgian army officers we are concerned with as they went on to serve as Royal Navy officers on H.M.S. Fidelity. The one who was to become the best known of these three was Lieutenant Albert-Marie Edmond Guérisse of the Belgian Army Medical Corps. He became second-in-command of H.M.S. Fidelity for a time, serving as Lieutenant-Commander Patrick Albert O’Leary. After being stranded in southern France in 1941, “Pat O’Leary” went on to become the became the leader of the Allied ‘PAT’ escape and evasion line. After the war some of Lieutenant-Commander O’Leary was interviewed about his memories of H.M.S. Fidelity. “It was at Gibraltar that my destiny was forged. A French Naval officer, Commandant Péri, was struggling against a rebellious crew. He called upon us to assist. We were happy to give him a helping hand; since his men wanted to make for an Algerian port and place themselves under the flag of a France that had surrendered. This vessel of 20 tonnes, which was called “Le Rhin”, had in fact been stolen by Péri at Marseille. Péri was the most splendid example of a pirate: steeped in bravado and vice. He was from Indo-China and had a lady friend on board, a young woman who, herself, bore a legendary name: Madeleine Bayard. The French Navy had entrusted to Péri with a mission that fascinated him: to sail on a harmless looking boat, he was to blow up German ships in neutral ports. At Las Palmas, he had done just this, by his own hands and helped only by his chief engineer and Miss Barclay, he had blown up an enemy vessel of 10,000 tonnes. His crew knew nothing about it. In November 1963, “Pat O’Leary”/ Albert Guérisse was the subject for an episode of the BBC Television series “This is Your Life”. His connection with SS ‘Le Rhin’ / H.M.S. Fidelity was discussed during this T.V. programme, not just by Lieutenant-Commander O’Leary but also by Commander Peter Painter, D.S.C., R.N. (Royal Navy attaché to Fidelity at Barry, South Wales) and two other Belgian army officers who served on Fidelity: Jack de Brabant and Jean ‘Pipitte’ Peters. Photograph No. 4 (above) shows Peter Painter, Pat O’Leary, Jack de Brabant and Jean ‘Pipitte’ Peters talking about H.M.S. Fidelity during the “This is Your Life” broadcast. “… he was very big and very tough, and settled any arguments with his fists. Lieutenant Guérisse was the only one of us who could do anything with him”. “Well, it’s quite a story. I had known when I was at school, a boy who was a good friend of mine and whose name was O’Leary and he was a French Canadian, in fact. He was the son of a diplomat. Thus, as Albert Guérisse was determined to have the apparently ‘Irish’ surname of O’Leary, it was suggested to him that his Christian name should be Patrick! Henceforth, for the rest of the war he became Lieutenant-Commander Patrick Albert O’Leary, R.N. It was under this name that he was awarded both the D.S.O. and George Cross. Just how ‘irregular’ was Fidelity and her crew? A few examples should suffice. On land, according to Commander Peter Painter, the whole ship’s company of H.M.S. Fidelity was “… a pain in the neck …they literally terrified Barry docks”. However, he was pleased to have Lieutenant-Commander Pat O’Leary as an intermediary when dealing with Commander Jack Langlais / Claude Péri of H.M.S. Fidelity. “We changed her appearance and nationality almost every night. I remember one day we were cruising along disguised as a neutral passenger steamer when an enemy aircraft cruised around and took photographs of us. So Pat – as First Lieutenant – told me and some others of the crew to dress up as women to look like passengers. However, when ‘Pipitte’ turned round, the crew of the British destroyer changed their mind when they saw his long black beard! For some reason, this tale of H.M.S Fidelity was omitted from the actual television broadcast. Nevertheless, it is preserved in the BBC’s official written transcript for Pat O’Leary’ “This is Your Life” programme (see reference at end of this article). 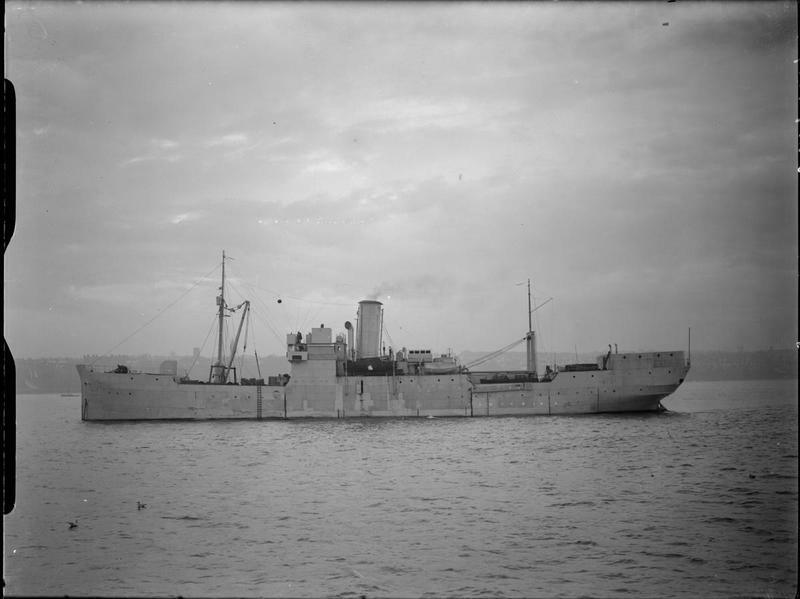 “Towards Christmas 1942, this boat which was heavily laden and carrying in particular some British Commandos, was sailing in a convoy when it was attacked by a silent enemy submarine off the Azores. It was a very heated episode: about twenty merchant ships went to the bottom. “Fidelity” received orders to launch a seaplane she was transporting. At the moment of take-off the plane overturned on the last wave and the torpedo it was armed with exploded against the hull of the boat, thereby significantly reducing its speed. The convoy continued on its way, leaving the “Fidelity”. Two days later, Commander Péri ordered Lieutenant O’Neill (whose real name was Peters, a fellow countryman) to put to sea with a Motor Torpedo Boat (M.T.B.) loaded with torpedoes and perform a reconnaissance mission. But the M.T.B. itself had damage to the engine and after breaking down had to wait for three days with no radio. Having repaired the vessel, O’Neill tried to find “Fidelty” but in vain. He tried to point his patrol towards where the vessel had been during the last radio contact, which was established on the night of 31 December 1942. In fact, it is believed that Fidelity was sunk off the Azores by German U-boat U-435 under the command of Siegfried Strelow. The loss of life was about 369 (274 crew, 51 Marines and 44 survivors of SS Empire Shackleton picked up by Fidelity a few days earlier). Only the two crew of Fidelity’s seaplane and the eight crew of her M.T.B. survived. The seaplane crew were picked up by H.M.C.S. St Laurent (H83) while the M.T.B. crew, commanded by Jean ‘Pipitte’ Peters / Johnny O’Neill, were picked up by H.M.C.S. Woodstock (K238). Two and half years after H.M.S. Fidelity was commissioned as a Royal Navy vessel, she had made her final voyage. This article is dedicated to the memory of H.M.S. Fidelity (SS ‘Le Rhin’) and all who sailed with her, especially those lost with her. While she and her crew may have been and unusual combination nevertheless it can surely be said they were full of character. To this day, they lie many fathoms down on the bed of the Atlantic Ocean. With the passage of time even those few who served on Fidelity and survived the war have long since passed away. May Fidelity and all who sailed on her rest in peace! N.B. – There are some differences between the ‘official’ written transcript and the broadcast.